It’s an atmospheric image – both literally and metaphorically – that will soon be sitting in wallets and purses across the UK. Painter JMW Turner’s The Fighting Temeraire tugged to her last berth to be broken up, 1838 is among the most famous artworks hanging in The National Gallery and, as the Bank of England has announced earlier this year, will adorn newly produced £20 notes from 2020 onwards. It commemorates the end of the famous ship, the 98 gun HMS Temeraire, which had played a heroic role in Lord Nelson’s victory at the Battle of Trafalgar in 1805 and, say reports, had been dubbed the “Fighting” Temeraire ever since (although it’s also suggested the ship was actually known by the crew as the “Saucy” Temeraire) . The oil painting, which Turner created in 1839, depicts the ship being towed away to be broken up (although, while it was actually towed from Sheerness to Rotherhithe in London – a westerly trip, the painting depicts it going eastward). 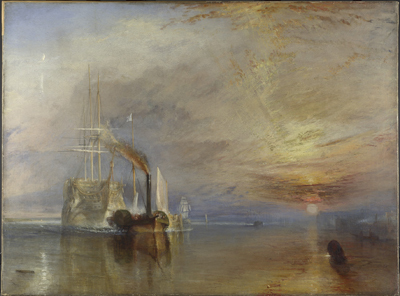 The Temeraire itself is drawn romantically, almost spectrally, while in front of it is a steam tug shown in hard modernity and, of course, in the backdrop is the majestic setting sun, evoking a sense of the end. The painting, which was bequeathed to the gallery by the artist in the 1850s, and which incidentally appeared in the James Bond film Skyfall in a scene in which 007 (Daniel Craig) meets Q (Ben Wishaw) in front of it, can be found in Room 34 of gallery. WHERE: The National Gallery, Trafalgar Square (nearest Tube stations are Charing Cross and Leicester Square); WHEN: 10am to 6pm daily (open to 9pm Saturdays); COST: free; WEBSITE: www.nationalgallery.org.uk.